The Mapping Project, Operation Doneve, is actively seeking input and involvement from Sarna's Editors and users. In order to promote effective communication and project progress, please determine which of the following sections are most applicable and initiate conversations in that section. If you have an idea that is rather different in scope than what is being discussed, please consider opening another independent thread to that conversation. Conversations will be periodically (and irregularly) archived. Gruese is seeking user input as to how the maps would best serve the system articles. Using the Sarna system article as an example, system articles generally have a map in the right top corner, initially generated by Nicjansma when he first opened Sarna's BattleTechWiki. However, through a number of issues detailed elsewhere, these maps are often inaccurate relative to present canon. The Project: Planets team has done an incredible job in trying to ensure that accurate coordinates are presented within the article and updating this primary map image (when possible) with manually-modified images that are more accurate in the presentation of positions. However, the Mapping Project is seeking to standardize these images across all system articles, in a way that is both accurate and easy to correct, update, and upload. One of the first things you'll notice is the difference in positions of planets: some have moved, others added. The test image is far more accurate, as it is based upon the Extrapolation Method of the SUCS. Both images depict about the same area of space, over 60 light-years out from Sarna, with 30- and 60-ly rings. The test image is far "busier" than the original, attributed to several reasons, including slightly differing scales and different fonts and font sizes. shaded background to match the political affiliation; in other words, instead of a white background with colored dots, the idea is to have featureless dots on a background matching the color of the realm. In this case, that background would have green for the Capellan Confederation under all of the systems shown that are controlled by them, and yellow and purple for the systems per their relevant realms (see "Example image" here, from the IS 3025 site). 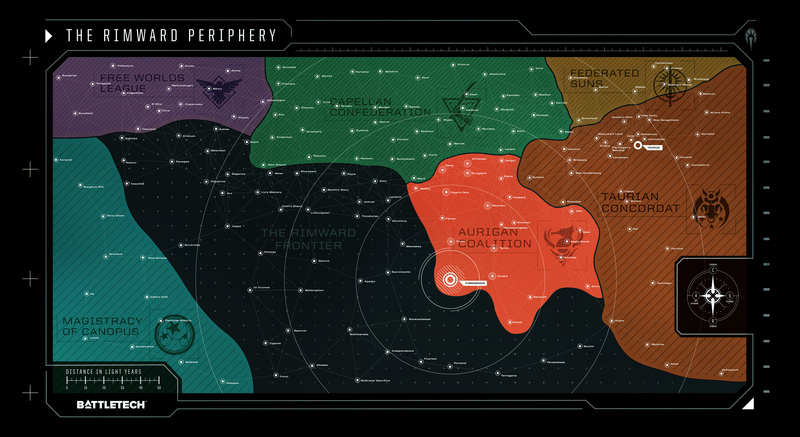 If the intention is to shade the background of the map dependent upon the political affiliation of the worlds, then the map should include the year the map reflects; not only do borders move back and forth a lot, but there are instances where quite notable worlds change hands - New Avalon is a Draconis Combine world in 3150, for example. The map is being auto-generated using the article names; that means a lot of claggage intended for wiki administration purposes - like the (system) suffixes - is appearing in the planet names, and cluttering the maps. I use pipes in the manually generated system tables to prevent that happening, and in the cases of worlds that change name like Runrig/Rhodos I normally go with the format Runrig (Rhodos). I'm not sure what the mechanistic way around this is, but my suggestion would be something like have whatever's generating the map reference a lookup file, matching article title against desired output - we could literally just have a file consisting of a long table with the article title in one column and the preferred output name in the other, and it wouldn't be much of a burden to update manually. I think the jump rings would be a useful addition, and I think they're also something historically associated with the wiki, so I'd be keen to see them retained. If we're going for the maps being shaded - which does make them more attractive - then we should find a way of linking in an obvious fashion to a key that explains the colour scheme. Even if we go with the CGL standard, there are some that are not immediately and easily deduced, and if we're going to have a range of maps through history, there are probably going to be states that aren't familiar to people. First off, thank you for your input, BrokenMnemonic. Years: this will be done. The intention right now is to have the primary map either the latest year map on the top of the page or 3025 as default, with that indicated. There will also be a map gallery section added to the lower parts of each article, with all of the primary years (2750, each Succession War, etc.) represented and marked. This will allow users to pull up several maps in tabs and compare successively (or however they choose). Claggage: great catch. I cannot say for certain Gruese and Volt haven't already caught that, but adding a "Map name" column to the database is something we can easily do. Jump rings: Noted and will pass that on. Shading legend: can you expand on the how we might represent this? (This image is a newer approximation of what the maps will look like; note the inset IS to help locate the region, if color isn't explanatory enough for some users.) I'd point out that the article itself will be rather indicative, but textually and thru the ownership table, as to whom controls the system when. You got me in trouble with the cross-site team, BrokenMnemonic. Apparently my contextual understanding of claggage is not the preferred use of the term! Step forth to have your wrist slapped. However, the suffixes are not an issue any longer. For the shading key, I'd suggest that you ask Gruese to generate an image showing all of the different possible shadings and their faction affiliation as a colour chart, and that we then amend the system infobox template to include a hard-coded reference and link to a copy of that chart hosted here on Sarna - so that every infobox as standard would include it as a field that can be clicked on, in the same way that every system infobox includes the hardcoded "System information" title. Which, looking at it, should probably be System Information. Claggage: that's what I told the group; I'm a sailor of 27+ years and had never heard that definition before. However, Google was all over it. Go figure. I like the chart idea, with the hard-coded reference. We can't build it yet, until the colors are finalized, but I'll share that idea with him. Obeedah: would you be willing to add a note to both Sharpe and Versailles with that background info? The SUCKit does show Sharpe and Versailles as the primary names, so I'll check with Gruese to see what's up. It may just be from an older data set. Claggage: I maintain that we're right, and people on the internet are wrong. @Frabby: The maps will be dynamically created, whenever the SUCKit coordinates are updated, so if/when they become canonical, it'd just be a matter of removing whatever tag the mapping software uses to identify them as apocryphal. But you've highlighted a good point about identifying them in the first place; I'll bring that up with the Operation Doneve group. Am I correct in thinking we all agree that the inclusion of apocryphal systems is acceptable, if properly marked? If the majority consensus is that they should go in, then I'll abide by the majority decision, but as I mentioned above in response to Frabby, if they go in, then they should be shown in such a way that it's immediately obvious and visible that they're different; my preference would be for the worlds and the names to be in something like a different colour, which isn't used for any faction at any point in time, and with a key somewhere nearby in every article flagging up that worlds showing up on maps in that colour are apocryphal/non-canon and are included for illustrative purposes only. I'll check with Gruese to see if maybe we can color the apocryphal worlds a different color, something that would be consistent but stand out on all background shades. The default right now is to have them tagged with (HBS), though Gruese is looking at making (apocryphal) work. What he needs is a consensus from us. So, question for those reading this far (including you, BM), how should apocryphal worlds be indicated on maps, in order of choice? - Tag with (apocryphal). The reason why they're apocryphal, e.g. (HBS), doesn't belong here and has little if any value in the context of the map project. I think this may be a relatively easy fix, BM. I realize I'm speaking for Nic without authorization, but I'm fairly certain (>90%) Nic could run a bot against that portion of the articles, adding the table to articles where it does not yet exist and correcting the present ones. For this discussion, let's call this the "distance bot". As it stands right now, we're planning on running the "coordinates bot" a few times a year, as new maps are released, and the "map bot" to update multiple maps on each article. I really don't think the "distance bot" would be too much to ask. What Sarna "says" is what Gruese will try to make happen with the maps. I wouldn't worry about the if it can be done technically, as I haven't heard anything too grandiose. However, we do need to form a consensus. I have more of an issue with apocryphal systems appearing in the nearest neighbour tables if we go with all worlds in a set radius - I wouldn't support including them if the decision is to simply include the top 10/12/20 closest worlds, because then canon worlds are "losing out" to apocryphal worlds, which feels wrong. If purely apocryphal systems are going to appear, then I'd suggest we either differentiate them by name or by colour or by both, so that they are clearly and visually distinct (and distinctive). - Ok, so I agree with you about being inclusive (via range) rather than exclusive (via Top 10/12/20). The interior of the Inner Sphere is much more crowded than other areas and for a good reason. It makes sense (to me) that all worlds within 2 jumps (60 lys) should be in a table. So....we're progressing; does anyone have any fundamental issues with the following? Apocryphal systems included within that range, but marked in someway to differentiate. The Distant Neighbors table shall include the 10 nearest mapped neighbors. I'm with you on keeping them on both maps and tables. I think Sarna's role is to track the status of items of interest, not "delete" them for the periods of time the canon does. We already do this on Ownership tables by reporting "no record" at critical years; I think ownership tables, maps, and distance tables should maintain the focus. Return to the project page "Project Planets/Mapping".